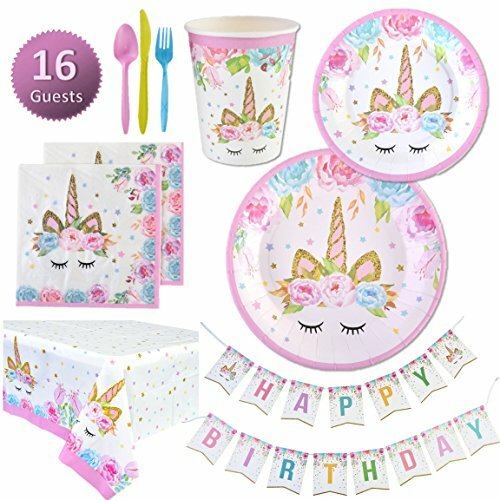 MY GRECA PARTY FAVORS UNICORN THEMED PARTY DECORATIONS – The perfect party supply set to throw a mystical and elegant birthday party for your little girl. Decorate your kid's birthday venue with this floral pink and gold unicorn party set. Just add some pastel color balloons and tassels, party favors and treats, and you have all you need for a magical event. CLICK THE “ADD TO CART” BUTTON NOW! and your birthday girl will have a memorable and fun time with family and friends with this lovely sleeping unicorn with eyelashes theme party kit. VALUE PACK- One stop solution! Get everything you need for your girl's unicorn themed party. Tableware and decorations in one convenient shipping. DISPOSABLE - Spend more time with your loved ones by having a mess free party with this disposable set. Simply toss and go when done, no clean up! SAFE & NON-TOXIC - The products are safe and non-toxic. Unicorn paper plates, cups and napkins are made of environmentally friendly biodegradable material. Light and flexible cutlery for kids and toddlers. If you have any questions about this product by My Greca, contact us by completing and submitting the form below. If you are looking for a specif part number, please include it with your message.